Before my kids were in school I remember parents of older kids telling me how much they like vacation days. The kids sleep in. Everyone eats breakfast in their pajamas. Then they might go on a family outing. A hike, maybe. I couldn’t conceive of such pleasure. When the preschool was closed due to a holiday it meant time lost on my own projects; more hours to juggle the needs of a toddler and a preschooler. My daughter would complain (read: pout and refuse to budge) if I tried to take them hiking. I couldn’t wait to get everyone back into a routine. But this year I guess we’ve turned the corner because the kids actually play together in their pj’s when there’s a holiday, building things like toy villages and Lego sculptures before their dad and I are awake. 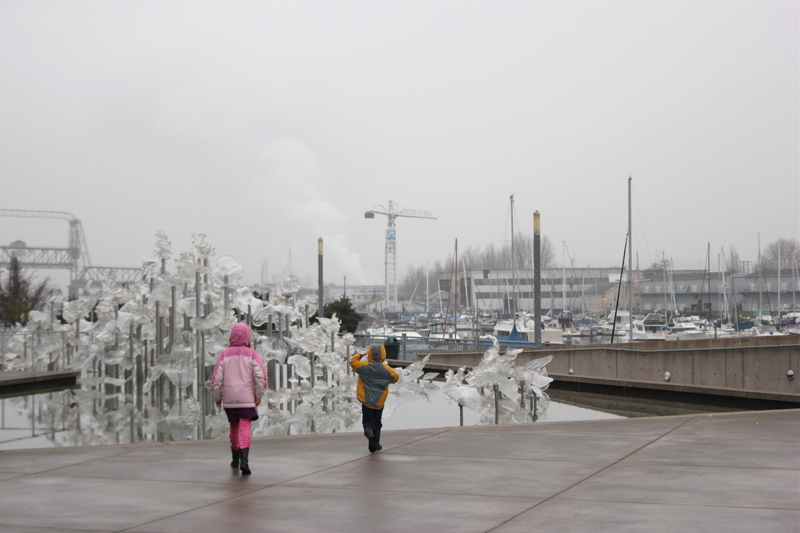 Monday was one of these lazy, lovely mornings and afterward we took the kids to the Museum of Glass where we saw these exhibits. My favorite was a glass forest in the Glimmering Gone exhibition: layers of clear glass forming the likenesses of underbrush and trees with a mirrored river cutting through. Sublime! I would have stood there all morning if I’d been alone. No cameras are allowed in the museum so I can’t show it to you, but I did catch an image of the kids near the entrance to the museum. It was raining when we went in and also as we left, adding to the charm of being indoors among beautiful objects for the morning. Because of all the showers this week, we’ve spent a lot of time indoors at home, too. And something that makes it cozy? Sea vegetables. Since we’re still waiting for the foraging season to begin, over the next few weeks we’ll turn our attention to different types of sea veggies. 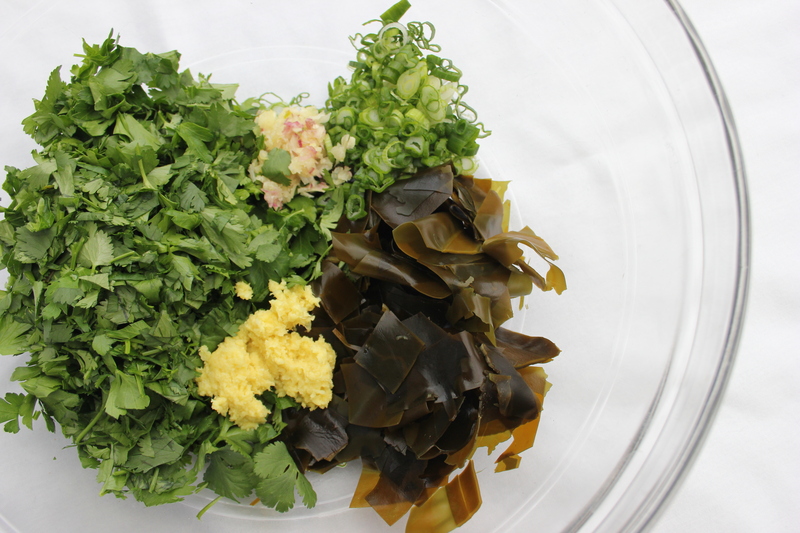 As you’ll see in this week’s salad, sea vegetables often don’t require cooking. Rehydrate and – voila. You have salad. And they’re full of good stuff. Nutrients in sea vegetables – a laundry list of vitamins, minerals and trace elements – are highly bioavailable, meaning it’s easier for the body to absorb them than those in land plants. 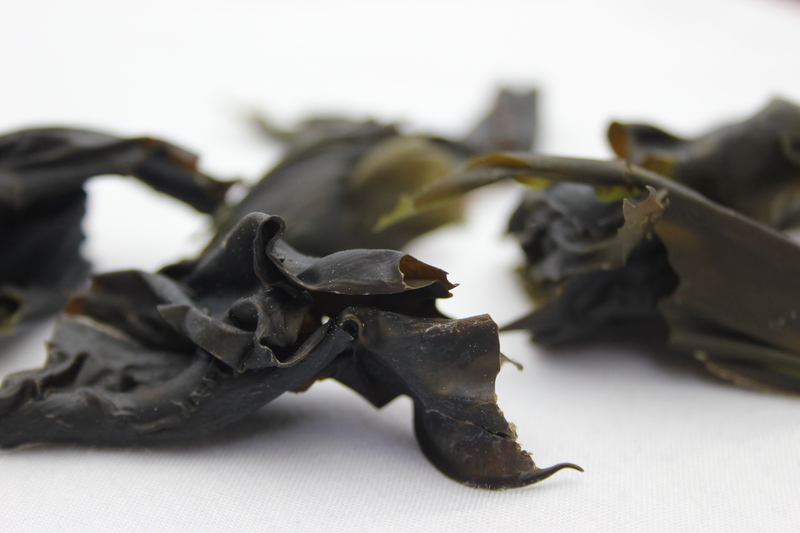 Sea vegetables may not be local in the strictest sense, but they’re wildcrafted and sourced on the West Coast. And since dried sea vegetables keep for a long period of time, they’re something to keep on hand in the cupboard. You never know when you might want a comforting broth or simple salad on a rainy day. flavors. I love to have this on hand as a side dish. 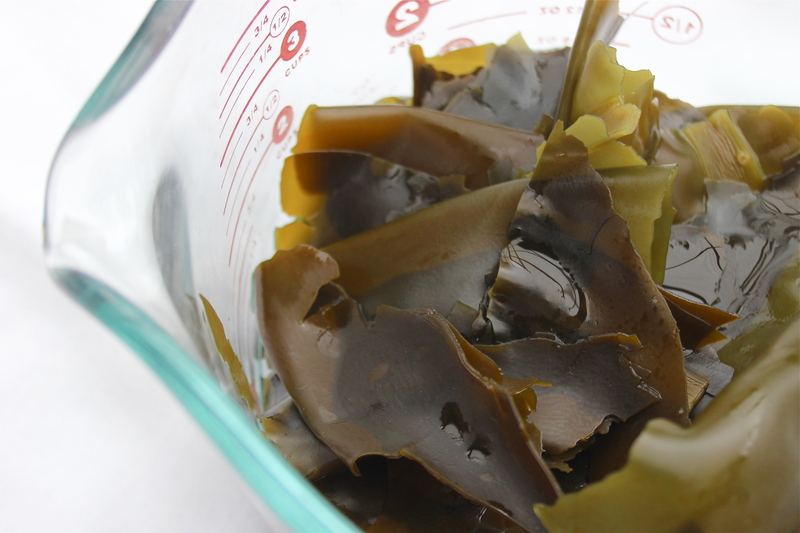 Soak the wakame in water to rehydrate, about 15 minutes. 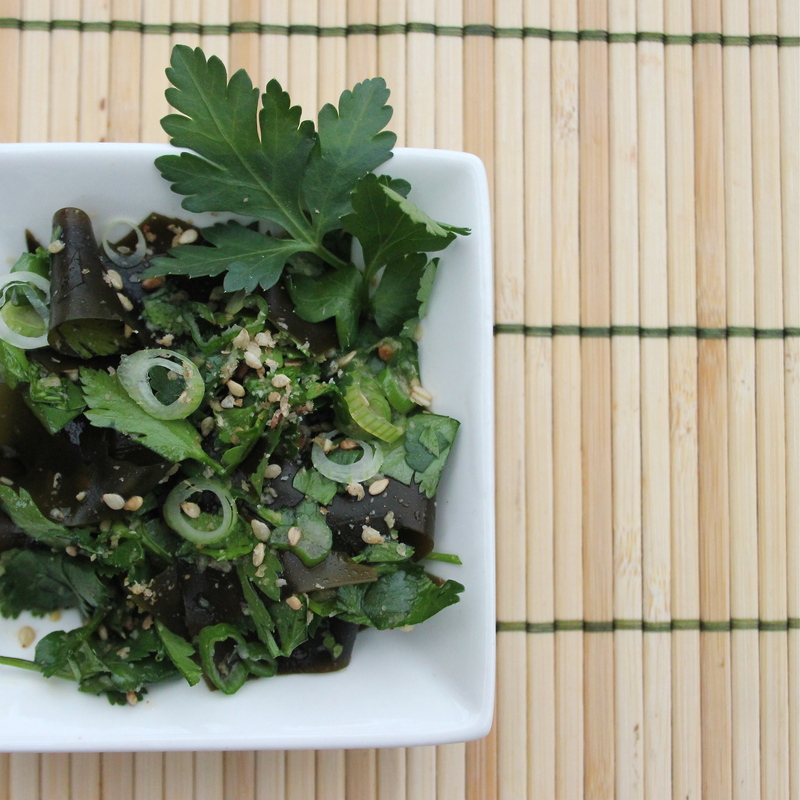 Mix the rest of the ingredients in a medium bowl and stir in the wakame. radish, carrots or celery for more color, crunch, vitamins and flavor. Allow the flavors to marry for an hour or so. Enjoy! This entry was posted in Recipes, Winter Vegetables and tagged Cilantro, Parsley, Salt, Scallion, Seaweed. Bookmark the permalink. Thanks for stopping by, Anastasia. A good one for your veggie weekdays, yes? As you suggested, I just happen to have some in my cupboard. I feel a salad coming on. Thanks! Yea! I love it when I just happen to have ingredients on hand. Hope you enjoy! Ah, that is cool you got to do something fun on their day off school! I have never had sea vegetables, but I should try! The salad looks so good and fresh! This looks so delicious. 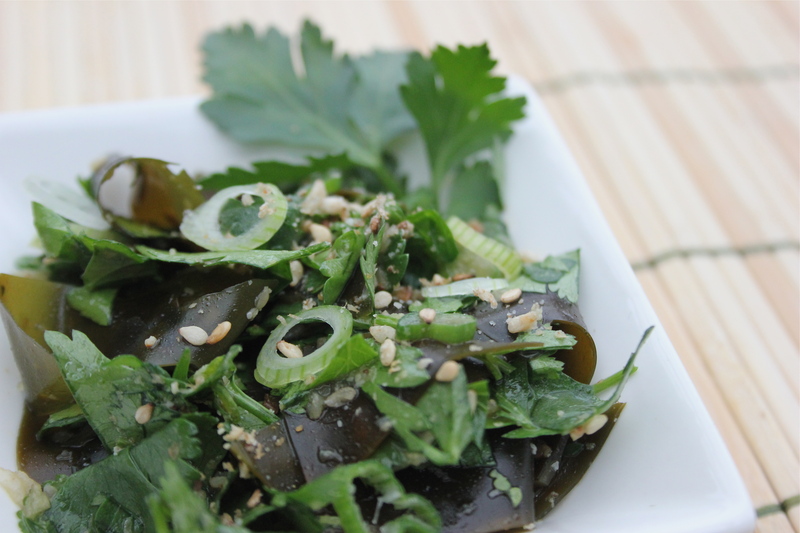 I’ve never thought of making seaweed salad at home. I will definitely try this. Let me know if you do. It’s a tasty one. This is so interesting! I do live close to the ocean, but have no idea where to get sea vegetables here. Sandy, seaweeds are around here, too. But it’s difficult to find local ones dried and packaged. The ones I buy, for the most part, are from Rising Tide Sea Vegetables out of California. You have to be careful about researching the cleanliness of the water if you go gathering yourself but out here there are tours that take you to the shore and guide your sampling and gathering. Sleuth around. I’d be interested to know if there are edible seaweeds in your area, too. Thanks for stopping by! 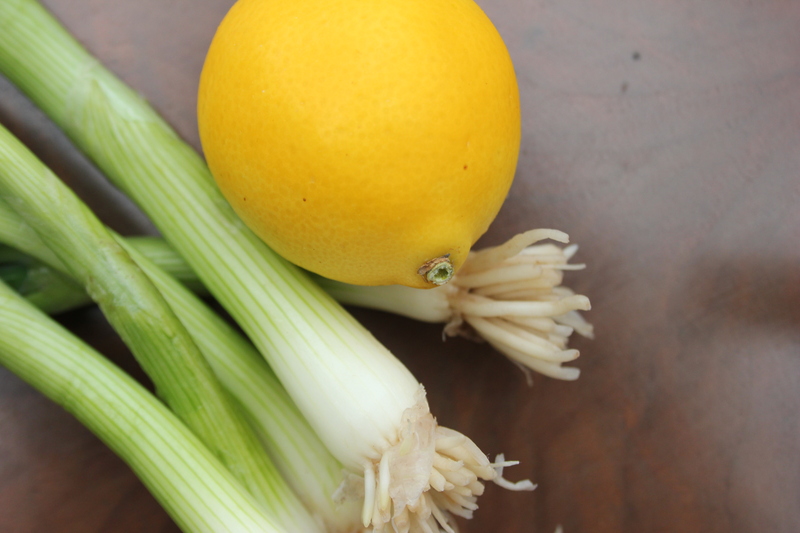 It was, Malou – and sea veggies are easy to cook with! This is gorgeous, resourceful, inventive, and looks wonderful! 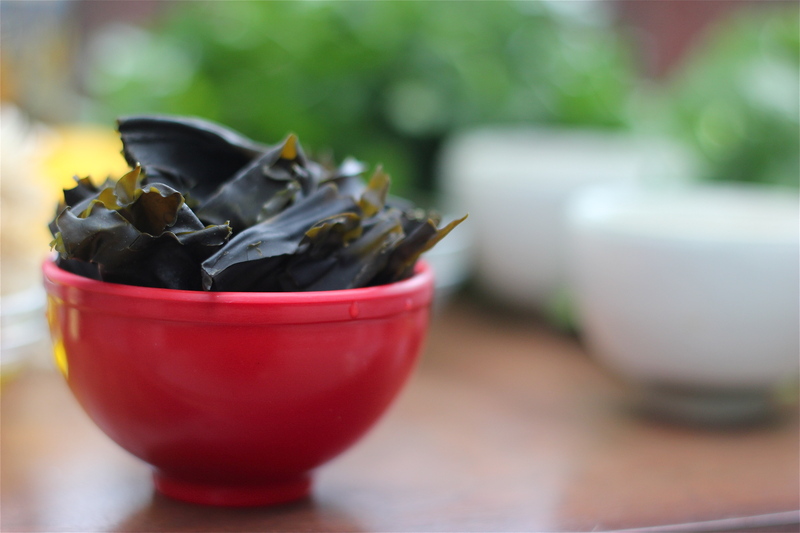 Sea vegetables are oh so good, you have inspired me – and what lovely photography! What kind things to say. Thank you so much, Shira. I’m glad you stopped by! I have never tried sea vegetables at home, I must be missing out! 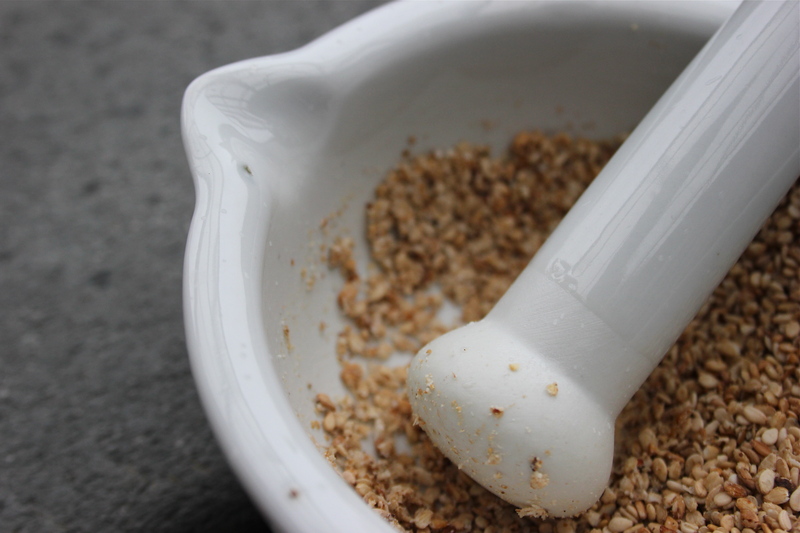 Easy winter nutrients, for sure. Thanks for dropping in! Ah, yes. It’s pretty delicious. Thanks for visiting!